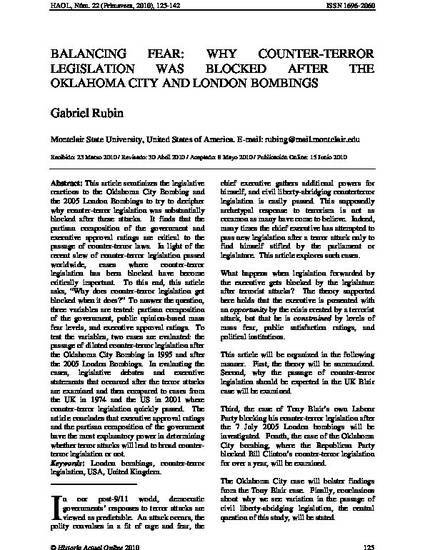 This article scrutinizes the legislative reactions to the Oklahoma City Bombing and the 2005 London Bombings to try to decipher why counter-terror legislation was substantially blocked after these attacks. It finds that the partisan composition of the government and executive approval ratings are critical to the passage of counter-terror laws. In light of the recent slew of counter-terror legislation passed worldwide, cases, where counter-terror legislation has been blocked, have become critically important. To this end, this article asks, “Why does counter-terror legislation get blocked when it does?” To answer the question, three variables are tested: partisan composition of the government, public opinion-based mass fear levels, and executive approval ratings. To test the variables, two cases are evaluated: the passage of diluted counter-terror legislation after the Oklahoma City Bombing in 1995 and after the 2005 London Bombings. In evaluating the cases, legislative debates and executive statements that occurred after the terror attacks are examined and then compared to cases from the UK in 1974 and the US in 2001 where counter-terror legislation quickly passed. The article concludes that executive approval ratings and the partisan composition of the government have the most explanatory power in determining whether terror attacks will lead to broad counter-terror legislation or not. Rubin, Gabriel. "Balancing fear: why counter-terror legislation was blocked after the Oklahoma City and London Bombings." Historia Actual Online 22 (2010): 125-142.